New Year is the time to rejuvenate life, love and make fresh beginnings. Flowers and chocolates are the best way to do so. Fresh flowers have been known to express every kind of emotion beautifully whether it is love, missing someone, or simply making amends. Add delicious chocolates to it and you have a heady mixture for expression. Carpe Diem means “ Seize The Day”. As we step into the brand new year, let us make it worth remembering. 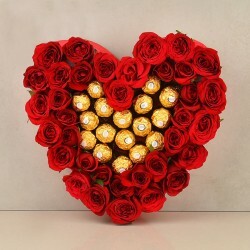 Send New Year flowers n Chocolates to your loved ones with MyFlowerTree online delivery. Amazing combo of freshly picked orchids and roses in a mesmerising combination of purple with white and a Ferrero Rocher chocolates will melt any heart. Fill up the cup of joy to brim with this Rocher Arrangement made of beauteous Asiatic Lilies, vibrant pink carnations along with purple orchids and a box of Ferrero Rocher chocolates arranged artistically in a basket. Everyone wants to spend time beautifully in the company of family and friends. But sometimes, duties of job and study schedules do not permit this. It is sad when you can not be there, but the exciting New Year Chocolates With Flower Combo can really dispel all sadness. 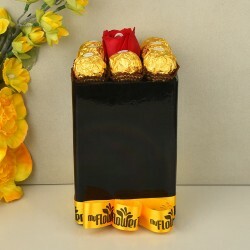 Send New Year flowers n chocolates online to reclaim happiness by placing an order today at the website of MyFlowerTree. Make the day of your precious ones and book for them a Delicious Delight combo of red, yellow and white carnations plus Cadbury’s Dairy milk chocolates. Our team will ensure an excellent condition on time delivery to the selected address. Life is beautiful. 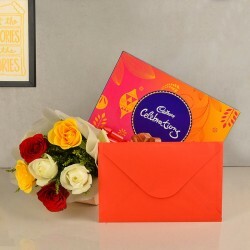 With a New Year Flower n Chocolate Online delivery, you can express your heartfelt love and sentiments to your dad, mom, spouse, siblings and your friends. Wish them by choosing from a wide variety of orchids, lilies, geberas, tulips and roses. Fresh and vibrant flowers are chosen for the adorable bouquet arrangements. Delectable chocolates are paired to make up a truly divine combo. Illuminate your special attachment with your precious people by sending them New Year Flowers With Chocolates. Catch up with a long lost buddy or chat your heart out this New Year. As an expression of diverse emotions like love, care, affection and romance, flowers and chocolates have been known to play their role well. MyFlowerTree is the highest rated online gift delivery portal where you can find thrilling combinations of New Year flowers n chocolates to wow the recepient. 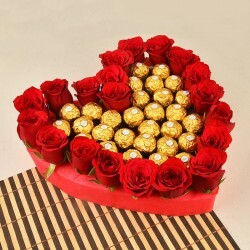 Avail our services today and book an order for New Year flowers and chocolates online delivery to see the difference. As a favoured delivery service, you will find excellent quality delivery and customer service with MyFlowerTree. Products in this category have been rated 4.5 out of 5 based on 104 reviews.